One 2015 ASL release that was awaited with much interest and curiosity was the “Burma pack” being worked on by Jim Burris and the St. Louis ASL Club. This would be an inaugural release–the first product by these folks–and no one knew quite what to expect. Would it be a labor of love? A discombobulated mess? The world wondered. It came as a pleasant relief, then, to discover that the final product was indeed a labor of love–a product with fairly high production values, good attention to detail, and a clear desire to maximize play value. The result was one of the best ASL products of 2015. It is a little hard to describe this product, what it is called, or who produced it. It is, on the one hand, clearly a historical module. However, it is also seemingly a magazine. 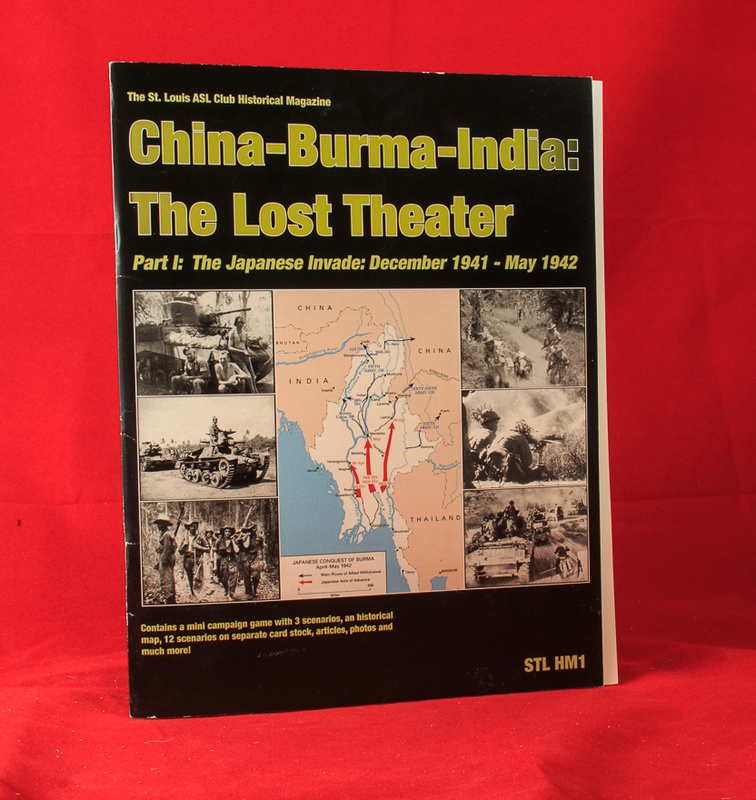 The front of the product has, in large bold letters, a title: “China-Burma-India: The Lost Theater, Part I: The Japanese Invade: December 1941-May 1942.” However, above this, in smaller letters is another title: “The St. Louis ASL Club Historical Magazine.” Since the China-Burma-India thing had a larger font size, that is what Desperation Morale went with. The ROAR website lists this product under “St Louis ASL Club Historic Magazine” (sic). The St. Louis ASL Club in the title of the magazine suggests that the St. Louis ASL Club might be the publisher, but the apparent publisher is credited as JagerSoft Games LLC, which appears to be Jim Burris. Who knows. It was Jim Burris and other St. Louis ASLers who did this module/magazine, regardless of what it is or what it is called or who is credited for it. As the title suggests, the theme of the module/magazine/whatever is the 1942 Burma campaign, when the Japanese launched an invasion of the lightly-defended British colony of Burma and captured Rangoon, the key to the whole country, after a British military disaster when a bridge was prematurely blown before British troops had a chance to retreat across it. The British–and a large Chinese expeditionary force sent from China to help defend their last supply lifeline to the outside world–could only engage in a fighting retreat that ended in a precipitous evacuation from Burma. They would not retake it until 1945. 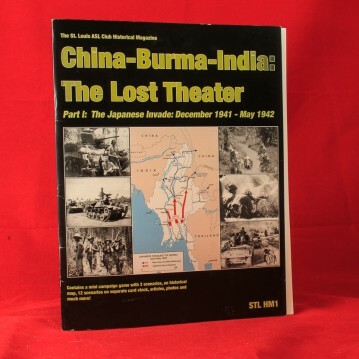 Burma is a favorite theater of ASLers, because it has both Japanese and Allied offensives, multiple nationalities, various “exotic” forces such as the Indian National Army or the Kachin Rangers or the Chindits, a range of different types of fighting that does NOT include caves and amphibious landings, and, for game purposes, a relative equality of firepower between the Japanese and their opponents (in contrast, for example, to late-war Central Pacific scenarios featuring USMC). Also, from the perspective of designers, source material is plentiful. Indeed, just a year earlier MMP published an Action Pack, To the Bridge!, which also covered the early months of the war in Burma. The magazine part of the product, The St. Louis ASL Club Historical Magazine, is a full-color 60-page glossy magazine with a sturdy cardstock cover. The physical production values are high. The writing and editing is okay, but probably above average for a third party ASL publication. There are a variety of articles, most of them fairly short, that basically consist either of historical materials or rules discussions/tips. One senses that the basic purpose behind the magazine component was 1) to introduce Burma to ASLers who knew nothing about the theater and 2) help introduce PTO to ASLers who were new to that part of the ASLiverse. 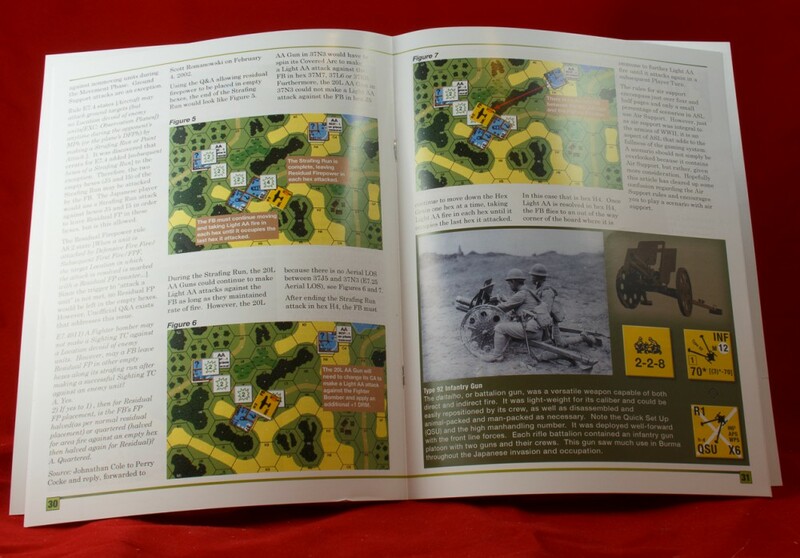 There is also some game content in the magazine; specifically, a mini-campaign game using the historical map that allows players to play three linked scenarios. The campaign, RaM (Roadblock at Mithwephok), depicts British attempts to eliminate a Japanese blocking force that had infiltrated behind British lines to sit on their single route of supply and retreat. Each scenario comes in two different versions–one version for the campaign and another version as “regular” scenarios; these second versions are in addition to the 12 scenarios included with the product, so really there are 15 different scenarios. The main difference between the two versions is that, in the campaign versions, players may choose most of their Order of Battle. In the “regular” versions, the scenario card specifies each side’s forces, as is typical (there is still some choosing, though). The campaign versions of the three scenarios appear as pages of the magazine, in addition to appearing on cardstock, so at first glance, it seems that there are nine different scenarios. But one can ignore the scenarios in the magazine and just go by what is on the cardstock cards. Although the “regular” versions are intended to be played as normal scenarios, there does not seem to be any reason why players couldn’t also choose to play the campaign versions, with their chooseable OBs, as stand-alone scenarios, too. Players get campaign game victory points for winning each scenario, as well as for getting more CVP than one’s opponent per scenario. There are about 2 pages or so of rules for the campaign game, making it much easier to get into than a “traditional” Red Barricades or Platoon Leader style of campaign game. The map isn’t dominated by any one feature. It has two areas of thick jungle through which a relatively open corridor–with the road–passes. A couple of streams bisect the map at roughly the 1/3 and 2/3 markers, and some rice paddies, a big patch of palm trees, and two motley collections of buildings round the area out. The artwork quality is a bit below that of the best third party publisher graphics but completely serviceable. The 22″ x 22″ size is a sweet spot in that it is a very manageable size, table- and playing area-wise, but provides enough space for large actions and considerable movement. Only the 3 campaign game scenarios (in whatever version) use the historical map. The other 12 scenarios included all use standard ASL geoboards: 5, 10, 17, 32, 37, 40, 42, 52, 57, 59, 61, 62, 67, 5b, 6b, 7b, 8a, q. Note that the last board is an ASL Starter Kit board. The scenario cards are full-color on glossy cardstock, without counter art, and are generally nicely done. The scenarios are a really nice mix of small, medium and large-sized actions. A couple of scenarios (campaign scenarios) use OBA; one scenario uses Air Support. One scenario uses Night rules. 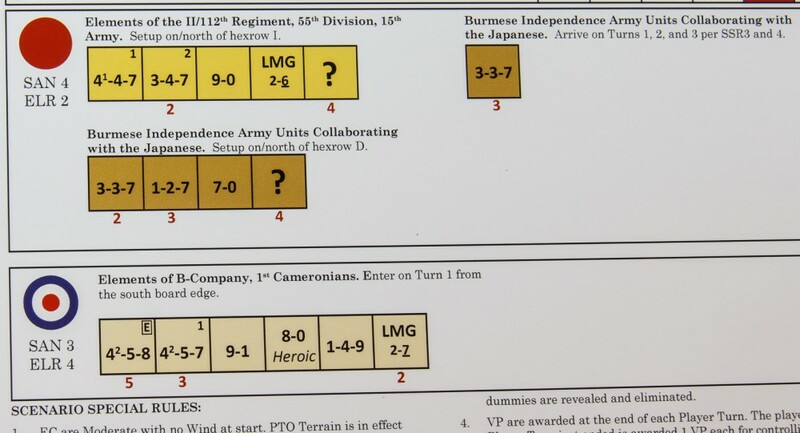 Of the 15 scenarios, 12 of them are British vs. Japanese matches (including three Gurkha vs. Japanese scenarios). Of the remaining three, one features Chinese vs. Japanese, another features Chinese/British vs. Japanese, and the third features British vs. Japanese/Burmese Independence Army. The scenarios were popular at the ASLOK tournament in October 2015, which is where many ASLers first saw the product. 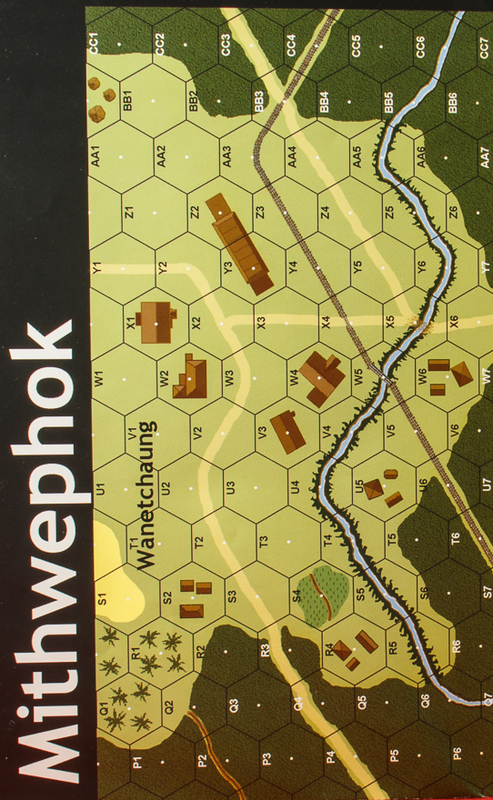 This writer played a number of the Burma scenarios at ASLOK and enjoyed all of them. 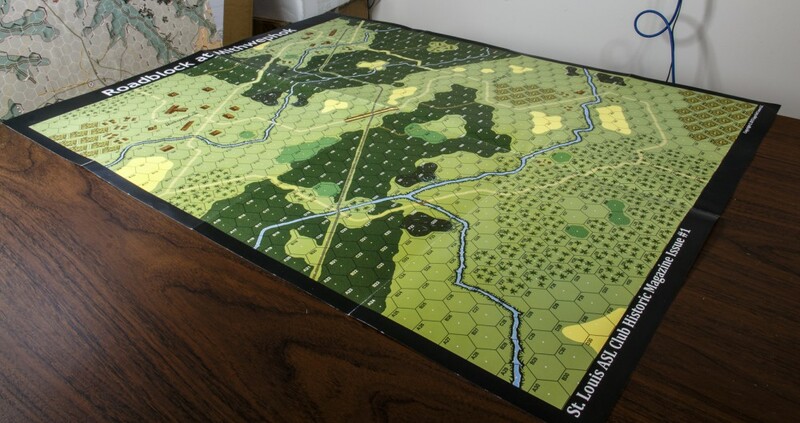 This included a playing of the big “monster” historical map scenario, STL RaM 3 (Clear the Road to Prome), in which the British have to get past a lot of Japanese to clear two crucial roadblocks. 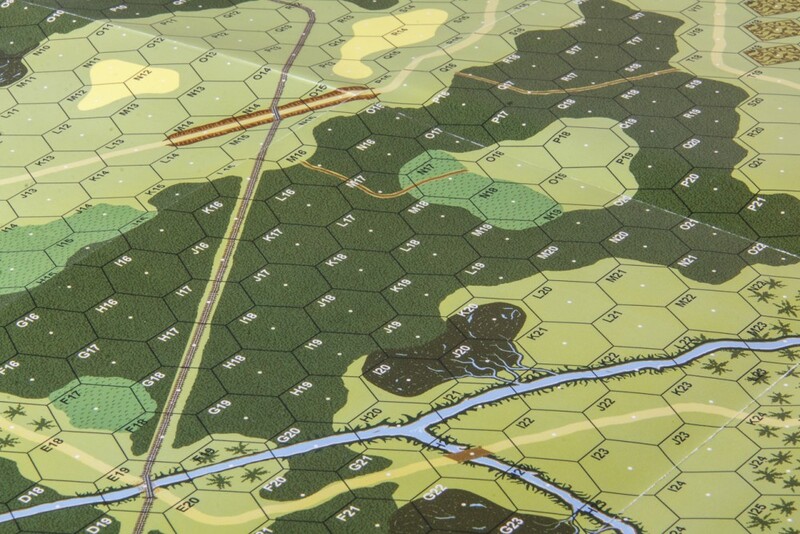 The interesting thing about this scenario is that reinforcements for both sides stream onto the board over the course of the first half of the scenario, but may possibly take a long time to get into the action. From the outset, both players need to think in terms of time, because at only 7.5 turns, the scenario doesn’t allow a lot of wasted energy. The Japanese have to defend a little village–where the roadblocks will be–and hinder/delay/obstruct the British attempts to get to the village with their reinforcements. 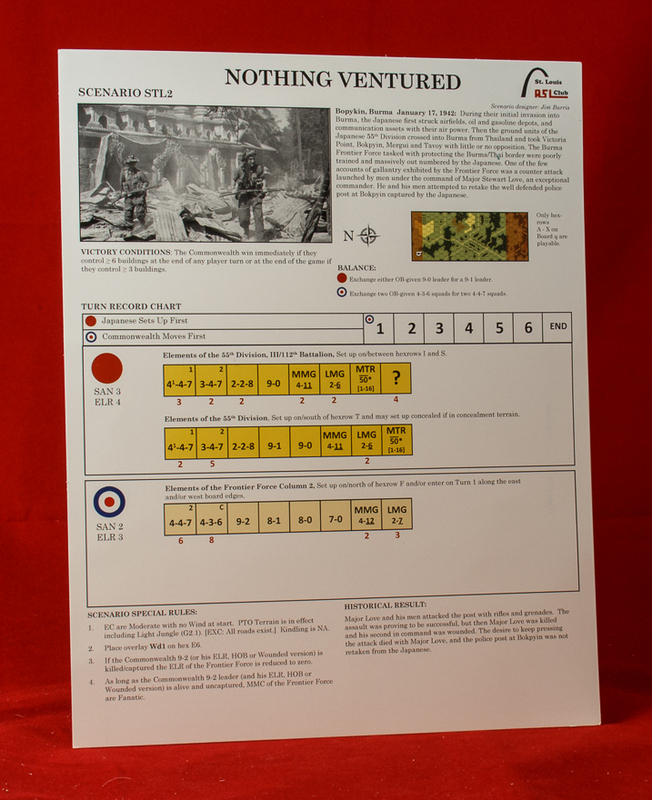 The British have no time to waste, which means that they must be aggressive, both in the jungle and across open ground (in this playing, the British won). STL RaM1 (Trouble at Mile Post 27) is a large but not monster scenario that uses half of the historical map. 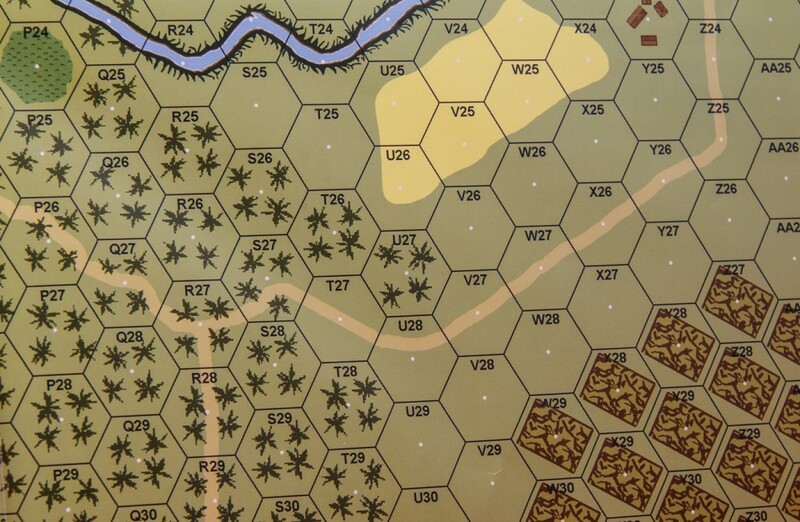 The third historical map scenario, STL RaM2 (Patrol at Wanetchaung) is smaller, pitting 11 British squads, 5 AFVs, and 2 guns against 7 Japanese squads, 1 gun, and 16 conscript half-squads on horses (representing part of a pack transport regiment). Conscript half squads on cavalry sounds like hoof-beats on tombstones. The Japanese get VP if any of those sad little soldiers survive or exit. Of the geoboard scenarios, the most meaty is STL1 (You Scratch My Back), which is the Chinese-Japanese slugfest. It depicts a major Chinese attack (29 squads, 4 guns, 1 carrier, various non-armored vehicles) on a Japanese force of 26 squads and 5 AFVs, plus air support. The product is loaded with playable scenarios of all types, whether one seeks a quick afternoon play session or a more intense, longer experience. A number of the scenarios are quite suitable for tournament play–and probably will see such play. Overall, this Burma product–whatever one calls it–shows what tender loving care and attention to detail can gain. It is a very impressive debut and one hopes that there will be follow-ups. This product is well worth getting.